Rate of Children Education Allowance (CEA) has been increased from Rs.1500 per month / child (max. 2) to Rs.2250 per month / child (max.2). Hostel Subsidy will also go up from Rs.4500 per month to Rs.6750 per month. Some allowances based on geographical location such as Special Compensatory (Remote Locality) Allowance (SCRLA), Sunderban Allowance & Tribal Area Allowance have been subsumed in Tough Location Allowance. The TLA will be in the range of Rs.1000 - Rs.5300 per month. Government has decided to enhance the rates of Siachen Allowance which will now go up from the existing rate from Rs.14,000 to Rs.30,000 per month for Jawans & JCOs (Level 8 and below) and from Rs.21,000 to Rs.42,500 per month for Officers (Level 9 and above). It will benefit all the soldiers and officers of Indian Army who are posted in Siachen. Cabinet approved HRA @ 24%, 16% & 8% from 1.7.2017 for X, Y & Z categary of cities. It will further revised upward @ 27%, 18% & 9% when DA reaches 25% and @ 30%, 20% & 10% when DA reaches 50%. HRA shall not be less than Rs.5400, Rs.3600 & Rs.1800 for X, Y & Z categary of cities. Provision of Laptops/notebooks and similar devices for eligible officers and provision of computers at residence of eligible officers - review of guidelines/instructions F.No. 08(34)/2017-E.II(A Government of India Ministry of Finance Department of Expenditure North Block, New Delhi Dated: 27th June, 2017 *OFFICE MEMORANDUM* *Subject: Provision of laptops/notebooks and similar devices for eligible officers and provision of computers at residence of eligible officers - Review of guidelines/instructions. * [post_ads] This Ministry is in process of reviewing the instructions relating to purchase of notebook/laptop etc. MACP/ACP benefit to SAS qualified officers appointed to the post of Section Officer/Assistant Accounts Officer: Important Clarification of DoPT shared by CGDA*** CONTROLLER GENERAL OF DEFENCE ACCOUNTS*** ULAN BATAR ROAD, PALAM, DELHI CANTT-10***No. Adm./ XI/11051/MACP/2016/VOL-I Dated 22-06-2017*** Sub: Regarding grant of MACP/ACP benefit to SAS qualified officers appointed to the post of Section Officer/Assistant Accounts Officer on the basis of CAG Circular No. 23 staff wing/2016 No. 39 staff(Ent-1) 184-2014 dated 20/06/2016*** DOP&T clarifiee that Departmental Examination is one of the fast track mode of promotion and the appointment on the base of Limited Departmental Examination cannot be treated as direct recruitment and the orders of C & AG dated 20.06.2016 is not consistent with the instructions of the Government. Further, DoPT has opined that treating AAO as a fresh recruits for the purpose of benefit of MACP will be violative of the provisions of RR. A commemorative stamp was also released to mark the occasion of 250 years of Survey of India by the Minister of State for Communication (I/C) and Railways Shri Manoj Sinha. 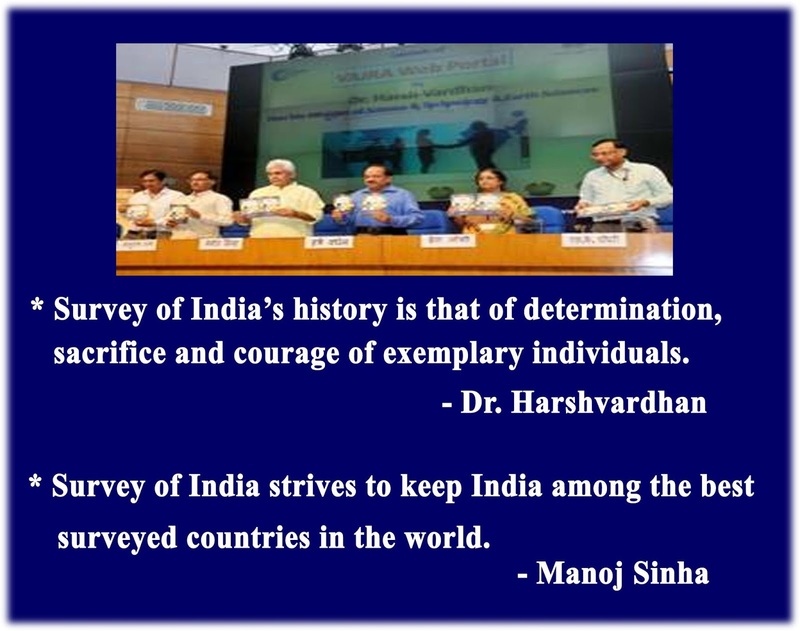 On the occasion, Shri Manoj Sinha said that "Survey of India has the distinct honour of printing the first Postage Stamp of India and the first copy of the Constitution of India.” The Minister said that the 250-year old Survey of India has adopted newer technology to overcome challenges and have started publishing digital maps. Ministry of Personnel, Public Grievances & Pensions, 22-June-2017 15:32 IST, Dr Jitendra Singh launches Online Software for Departmental Proceedings** The Union Minister of State (Independent Charge) Development of North-Eastern Region (DoNER), MoS PMO, Personnel, Public Grievances & Pensions, Atomic Energy and Space, Dr Jitendra Singh launched the online Software for Departmental Proceedings, here today. Leave Entitlement of Casual Labourers with temporary status. *** No. 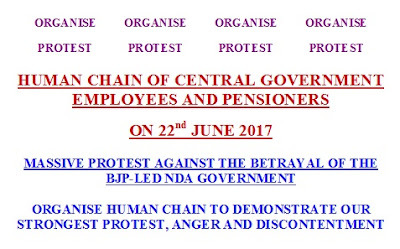 01-07/2016-SPB-I, Government of India, Ministry of Communications, Department of Posts *** Dak Bhawan, Sansad Marg,***New Delhi – 110001. ***Dated: 12th June 2017*** Subject: Leave Entitlement of Casual Labourers with temporary status*** Department of Posts had circulated a Scheme viz. Casual Labourers (Grant of Temporary Status and Regularization) Scheme vide Directorate’s letter No. 45-95/87-SPB-I dated 12.04.1991 which has been amended from time to time. 7th Pay Commission: Central govt employees can hope for good news on allowances; Air India privatisation gains momentum*** There is a possibility of the Union Cabinet taking a decision on raising allowances for Central government staff as recommended by the 7th Pay Commission. The Union Cabinet is expected to deliberate on raising allowances for Central government employees when it meets this week, apart from mulling over various options on restructuring national carrier Air India, including privatisation even as unions have warned of protests. All India Services (Performance Appraisal Report) Amendment Rules, 2017: Notification dated 15.06.2017 MINISTRY OF PERSONNEL, PUBLIC GRIEVANCES AND PENSIONS (Department of Personnel and Training) *NOTIFICATION* New Delhi, the 15th June, 2017 *G.S.R. 596(E)*.-In exercise of the powers conferred by sub-section (I) of section 3 of the All India Services Act, 1951 (61 of 1951), the Central Government. after consultation with the State Governments, hereby makes the following rules further to amend the All India Services (Performance Appraisal Report) Rules, 2007, namely:- 1. The Cabinet Secretary assured that, all the things are in the process and most probably would be placed in the next Cabinet meeting. Normally, Union Cabinet meets on every Wednesday, but this time 21st June, 2017 being “Yoga Day”, this may defer for one or two days, so according to the assurance given by the Cabinet Secretary, we hope that the matter of the allowances would be settled within this month. We have also come to know from the reliable sources that the Committee on National Pension System(NPS) has also submitted its report and some serious discussion is on for its implementation….. 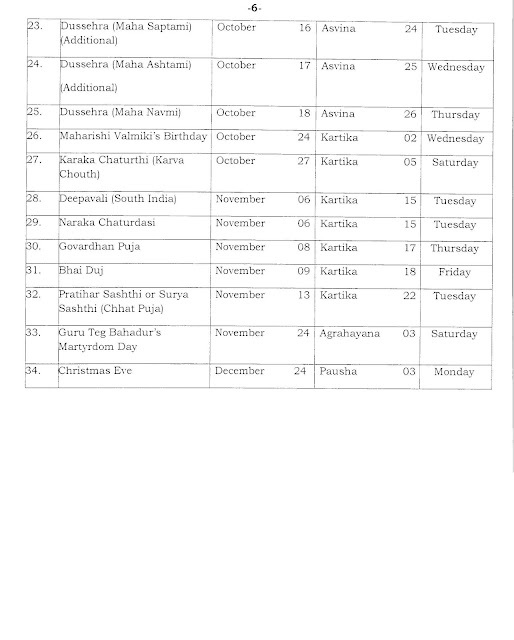 Holidays to be observed in Central Government Offices during the year 2018- DoPT O.M. 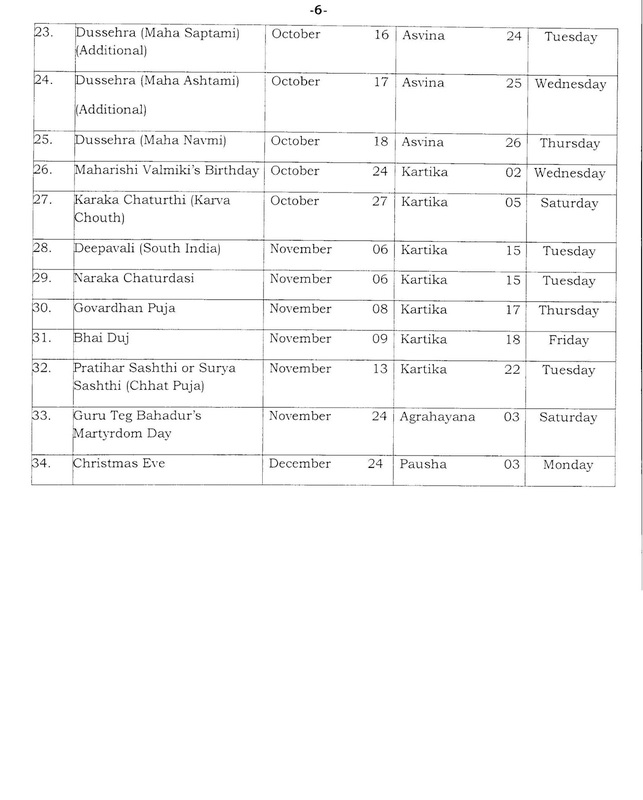 Holidays to be observed in Central Government Offices during the year 2018 – reg. Government of India, Ministry of Personnel, Public Grievances and Pensions (Department of Personnel and Training), Establishment (JCA-Q) Section, North Block, New Delhi vide O.M. No. 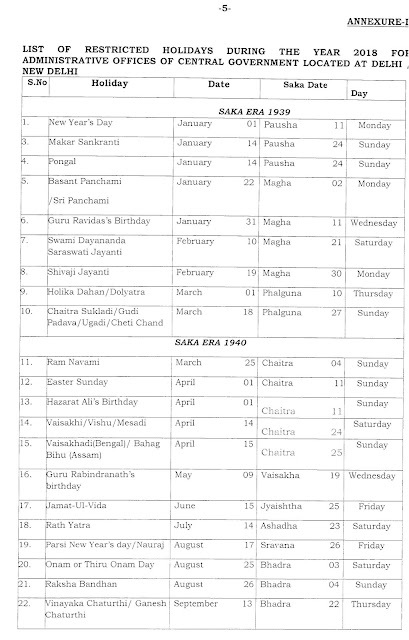 F.No.12/3/2017-JCA-2 dated the 14th June, 2017, issued list of Holidays to be observed in Central Government Offices during the year 2018. No.21011/02/2015-Est(A-lI)-Part II, Government of India, Ministry of Personnel, Public Grievances and Pension, Department of Personnel & Training, North Block, New Delhi – 110001, Dated the 13th June 2017**OFFICE MEMORANDUM** Subject: Online generation and recording of Annual Performance Assessment Report (APAR) on SPARROW (Smart Performance Appraisal Report Recoding Window) for all Organised Group ‘A’ services - Extension of timelines for completion of APAR for the year 2016-17. As all the Cadre Controlling Authorities of Organised Group ‘A’ Services are aware that it has been decided to implement online generation and recording of Annual Performance Assessment Report (APAR) of officers under their cadre from the reporting year 2016-17, through SPARROW platform. DoPT introduced 'SPARROW' for CSS/CSSS officers. No. 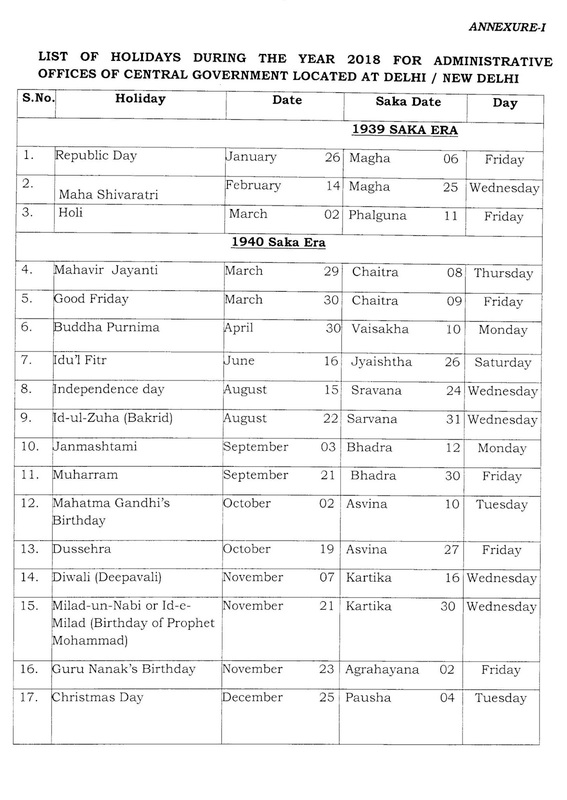 22/10/2015-(IS-l (APAR), Government of India, Ministry of Personnel. Public Grievances & Pensions, Department of Personnel & Training, CS-l(APAR), 2nd Floor, A-Wing, Loknayak Bhawan, Khan Market, New Delhi, Dated 6th June, 2017 *** OFFICE MEMORANDUM *** Subject: Introduction of ‘SPARROW’ for CSS/CSSS officers. ***The undersigned is directed to refer to Office Memorandum No. 22/10/2015-CS-l (APAR) dated 18th January, 2017 regarding introduction of on-line recording system of APARs for US level officers for CSS and equivalent levels in CSSS. NOTICE : Retiring officials may get honorarium for engaging themselves as Inspecting Officers and members of the Flying Squad for conducting/supervising of examinations of SSC. DoPPW has launched the initiative "SANKALP" for retiring central government civil pensioners/retiring emoployees for voluntary acitivities. 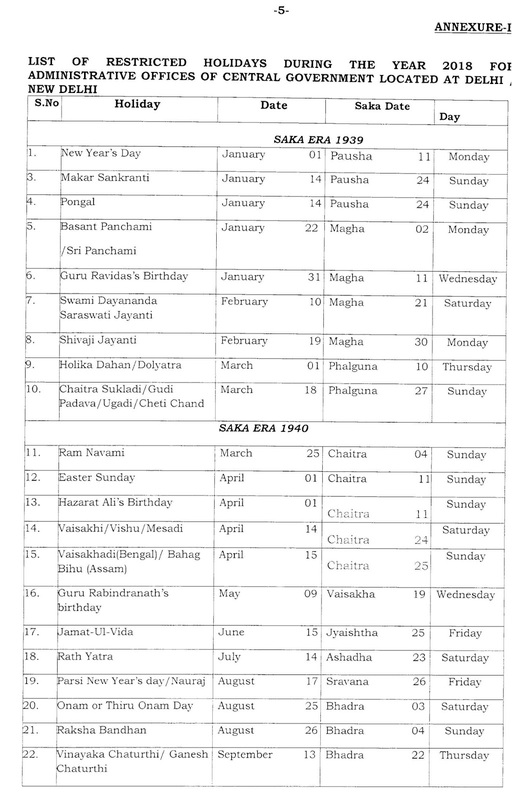 All retiring employees are hereby requested to register themselves on "SANKALP". Nearly 50 lakh central government employees could get revised allowances under 7th pay commission award, including HRA, from July, says a report. The Union Cabinet could take up proposals on 7th pay commission allowances (including HRA) next week, Shiv Gopal Mishra, the convenor of National Joint Council of Action (NJCA), told NDTV. The employee union leader also said that there is a possibility of higher HRA or house rent allowance than that recommended by the 7th pay commission. HRA accounts for bulk of the total allowances. The Union Cabinet on Wednesday did not take up proposals related to 7th pay commission allowances, including HRA, as it was not part of the meeting's agenda. 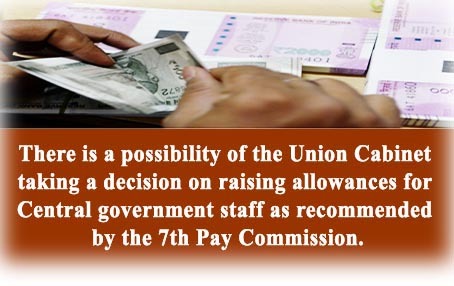 Recommendations of the 7th Central Pay Commission - bunching of stages in the revised pay structure under Central Civil Services (Revised Pay) Rules, 2016 *** No.1-6/2016-IC (Ft) Government of India, Ministry of Finance, Department of Expenditure (Implementation Cell, 7th CPC), Room No. 215, The Ashok, New Delhi, the 13th June, 2017 *** OFFICE MEMORANDUM *** Ministry of Finance, Department of Expenditure advised All Ministries/Departments, that the implementation of the provisions on bunching in OM dated 07.09.2016 may be put on hold till the time the detailed instructions in this regard are issued by Department of Expenditure. It is also requested that if orders on account of bunching have already been issued by Ministries/Departments but not implemented, the same may not be given effect to. The Union Cabinet has fixed a new date to take up the issue relating to higher allowances and HRA as per the 7th Pay Commission. Sources told OneIndia that the matter was not taken up on Wednesday by the Cabinet. Now the agenda will be set following which the matter will be taken up for final consideration. A Union leader who did not wished to be named said that the matter will be taken up soon by the Cabinet. 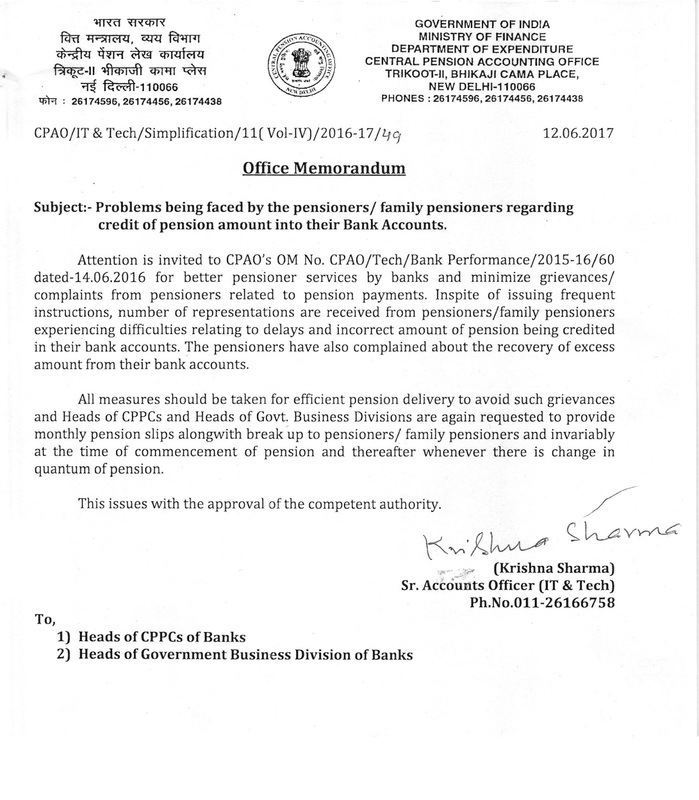 7th CPC Pension Revision and Payment of Arrears i.r.o. 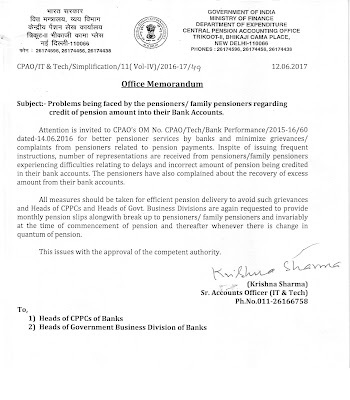 Pre-2016 Pensioners: CPAO instructs to Bank for time bound implementation GOVERNMENT OF INDIA MINISTRY OF FINANCE DEPARTMENT OF EXPENDITURE CENTRAL PENSION ACCOUNTING OFFICE TRIKOOT-II, BHIKAJI CAMA PLACE. NEW DELHI-1 10066 CPAO/IT&Tech/Revision(7th CPC)/19.Vol-III/2016-17/41 06/06/2017 *OFFICE MEMORANDUM* *Subject: Implementation of Government’s decision on the recommendations of 7th Central Pay Commission – Revision of pension of pre-2016 Pensioners / Family Pensioners, etc.-reg. *Reference is invited to the Department of Pension & Pensioners’ Welfare OM No.38/37/2016-P&PW (A) dated-12th May 2017 (copy enclosed) regarding revision of pension of pre-2016 pensioners/family pensioners under 7th CPC recommendations. Validity of downloaded Aadhaar (e-Aadhaar) as Proof of identity: Clarification by UIDAI ** F.No. 14014 / 8 / 2011-Logistic Vol.II, Government of India, Ministry of Electronics & IT, Unique Identification Authority of India, Logistics Division ** 9th Floor, Tower-I, Jeevan Bharti Building, Connaught Circus, New Delhi-110001, Dated the 28th April, 2017 ** CIRCULAR ** Subject: Validity of downloaded Aadhaar (e-Aadhaar) as Proof of identity - regarding. CGEGIS Tables 2017: Period From 01.04.2017 to 30.06.2017 - Tables of Benefits for the savings fund *** No.7(2)/EV/2016, Government of India, Ministry of Finance, Department of Expenditure, New Delhi, the 2nd June, 2017 ** OFFICE MEMORANDUM ** Sub: Central Government Employees Group Insurance Scheme-1980 – Tables of Benefits for the savings fund for the period from 01.04.2017 to 30.06.2017. 7th CPC - Revision of pay and allowances and pension/gratuity/commutation of pension i.r.o. Defence Civilian: CGDA seeks information **Office of the Principal Controller of Defence Accounts (Central Command), Cariappa Road, Cantt., Lucknow, Pin Code - 226002 ** No.PT/3088/CGDA-VI dated 25/05/2017 ** Subject: Implementation of Government decision on the recommendation of 7th CPC- Revision of pay and allowances and pension/gratuity/commutation of pension in r/o defence civilians who have relinquished service on a/c of retirement, death etc.